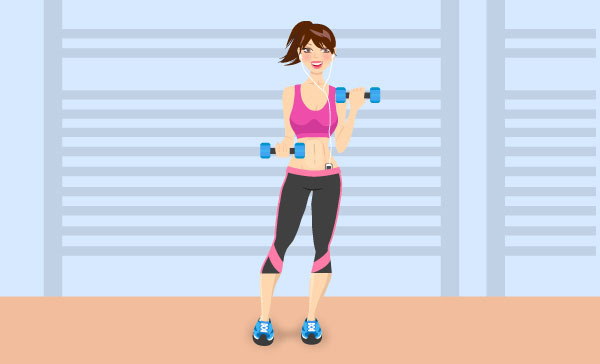 Improve your drawing skills or put them to the test by following this tutorial and learn how to draw a fitness girl character in Adobe Illustrator. Some people love the Pen Tool, some people hate it and some don’t understand it but practice is the key. Let’s make the Pen Tool your best friend by the end of this tutorial. 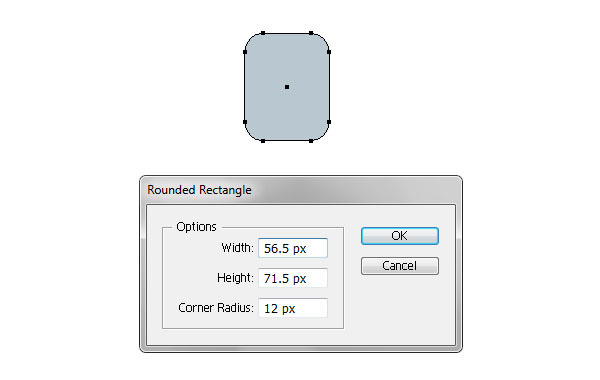 Start with a rounded rectangle having the dimensions shown. Draw a 41 x 50 px rectangle right under the first shape; then go to Effect > Warp > Shell Lower and apply a 20% Horizontal Bend. The fill colors are not important at this point. Next, draw two 36 x 100 px ellipses and arrange them under the rectangle as in the following image. 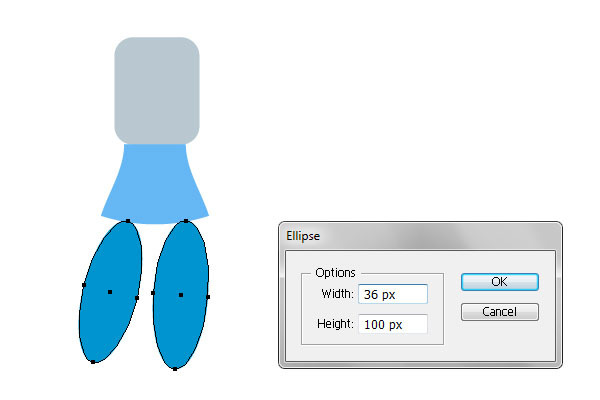 Draw other two ellipses but smaller, 24 x 84 px and arrange them as shown below. Now, focus on the first rounded rectangle. Grab the Add Anchor Point Tool (+) and add a lot more points on the path. Switch to the Direct Selection Tool (A) and distort this shape by moving these points individually and rotate their handles until you get a shape like in the image below. Fill the new shape with the color indicated and name it “chest”. Now, select the blue rectangle and from the Object menu choose Expand Appearance and Ungroup (Shift-Control-G) if necessary. Use the Add Anchor Point Tool (+) again to add more points along the path and using the Direct Selection Tool (A) distort this shape by moving these points and rotate their handles. Fill the new shape with the same beige color and name it “waist”. 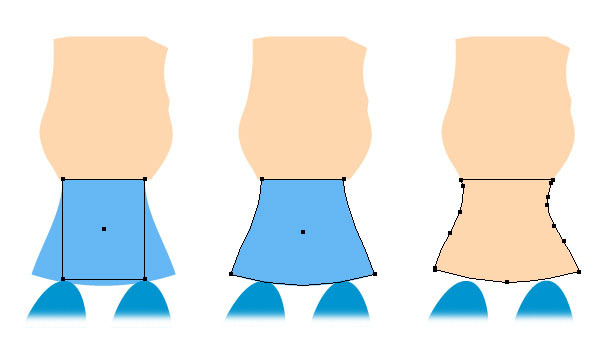 Grab the Pen Tool (P) and draw the shape of the neck right above the “chest” as in the following image. 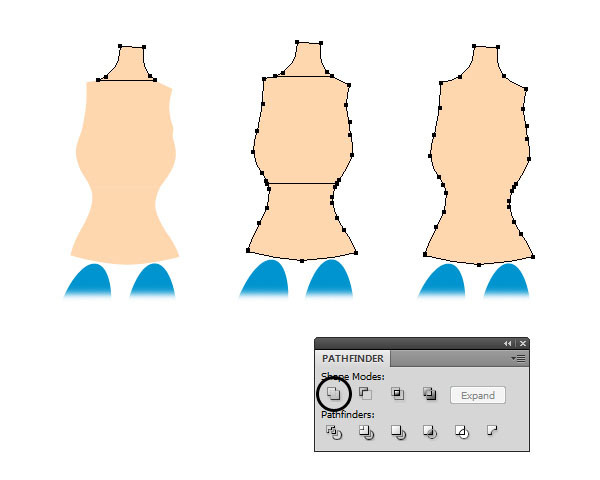 Now, select the “neck”, “chest” and “waist” and press Unite in the Pathfinder panel in order to obtain a single shape. Name the new shape “upper body”. 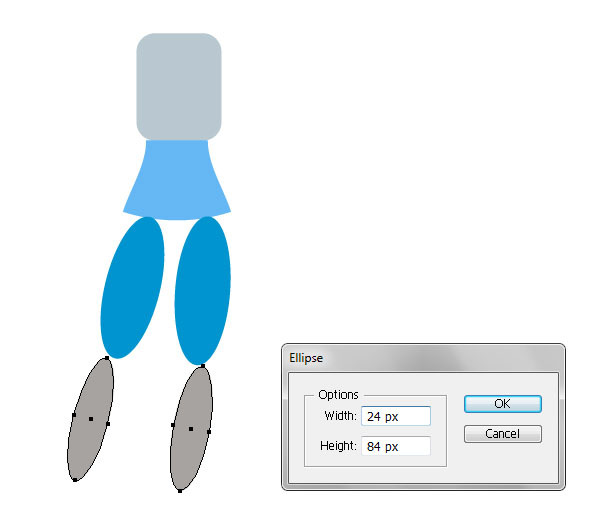 Next, grab the Pen Tool (P) and draw the shape of the legs using the four ellipses as reference. This will take a while but take your time and draw around the ellipses and don’t forget that you can make extra adjustments at any time with the Direct Selection Tool (A). When you are happy with the result, name the shape “legs” and fill it with the same beige color. 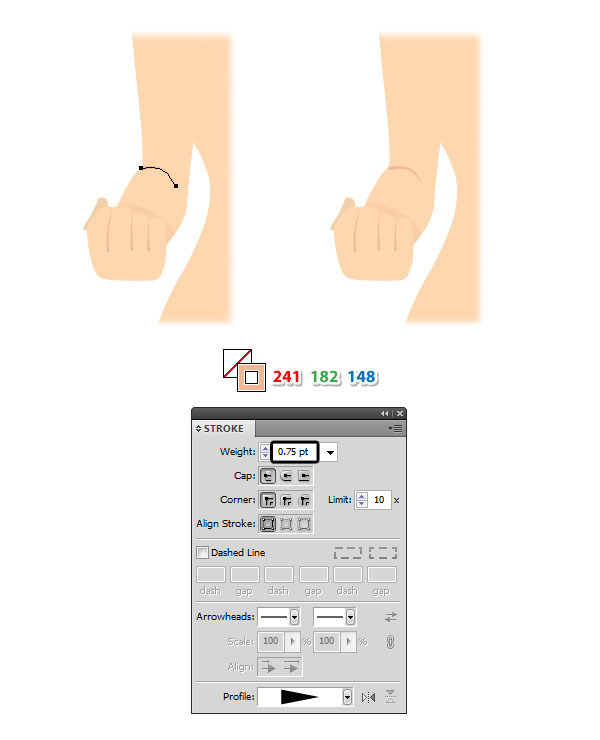 Now, focus on the upper body (1) and draw the arm (2) with the Pen Tool (P) and then continue with the forearm and the hand (3). 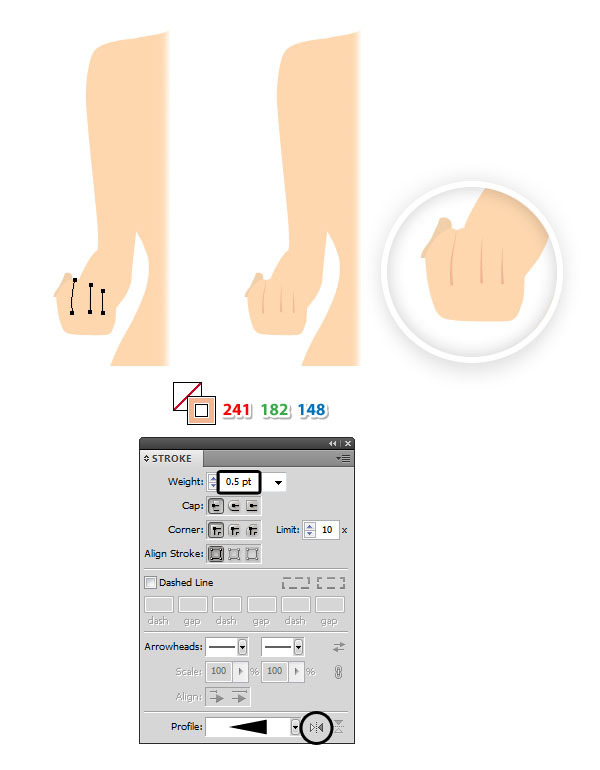 Use the Pen Tool (P) to draw four small paths between the fingers. 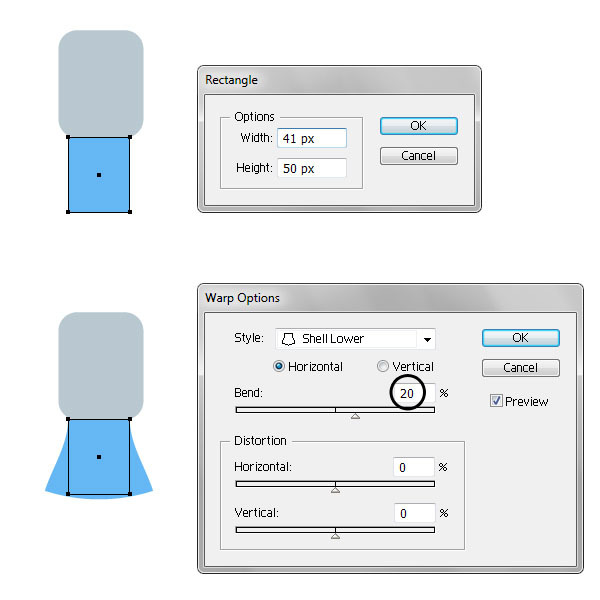 Select a 1 pt Stroke and the Width Profile 5 in the Stroke panel. The thinner side of the brush should be at the top and the thicker side should be at the bottom. If not, press the Flip Along option in the Stroke panel. 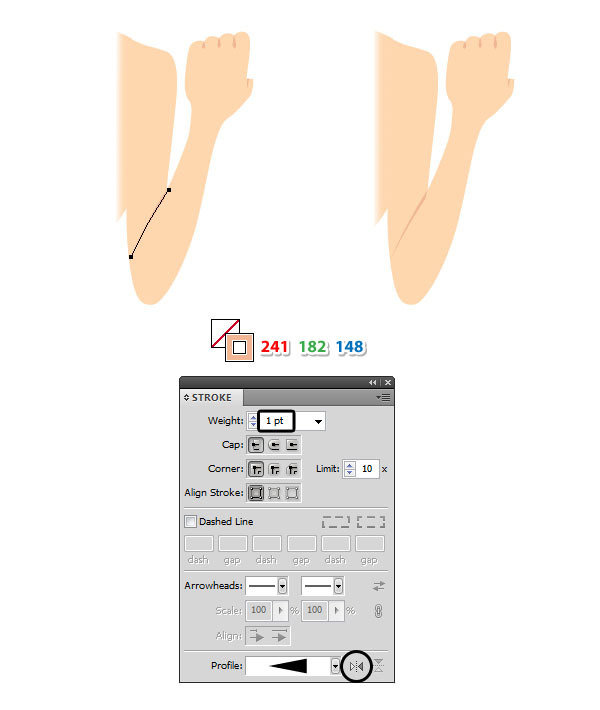 Draw a path with the Pen Tool (P) to define the area where the arm is bent. 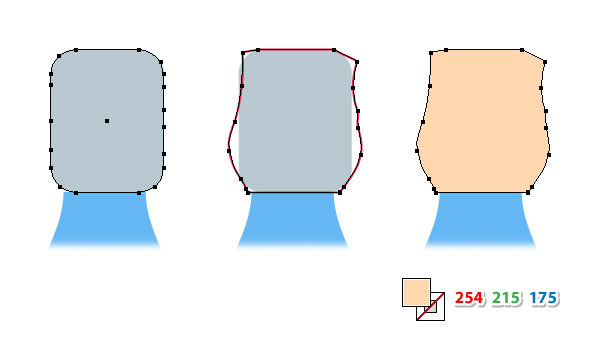 Select a 1 pt Stroke and the Width Profile 4 in Stroke panel. If the brush is flipped, press the Flip Along option again. 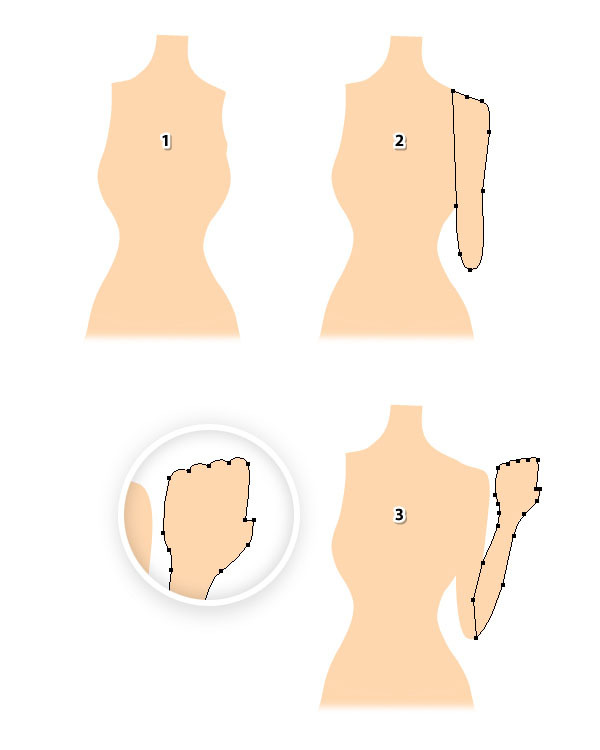 Next, draw the other arm (1) and after that, the shape of the fist (2) followed by the thumb (3). Use the same beige color to fill the arm but for the thumb use a slightly darker shade. 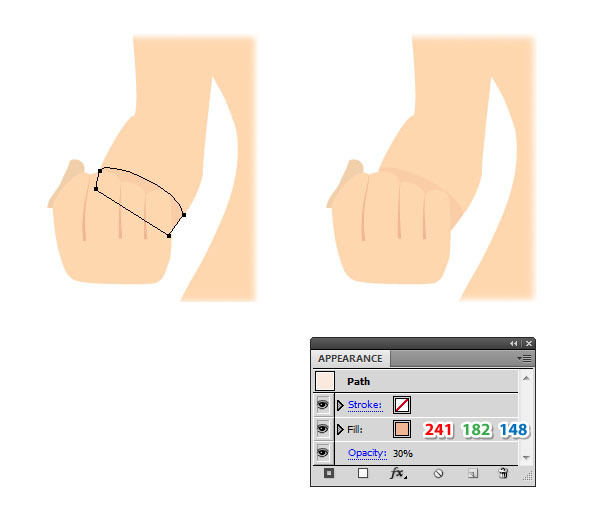 Use the Pen Tool (P) to draw three small paths to define the fingers. Select a 0.5 pt Stroke and the Width Profile 4. The tip of the brush should be at the top and the thicker side of the brush should be at the bottom. If not, press the Flip Along option in the Stroke panel. To create a shadow between the fist and the arm, draw a shape like in the following image. Fill it with the color indicated and reduce the Opacity to 30%. Send this shape behind the fist but in front of the arm. 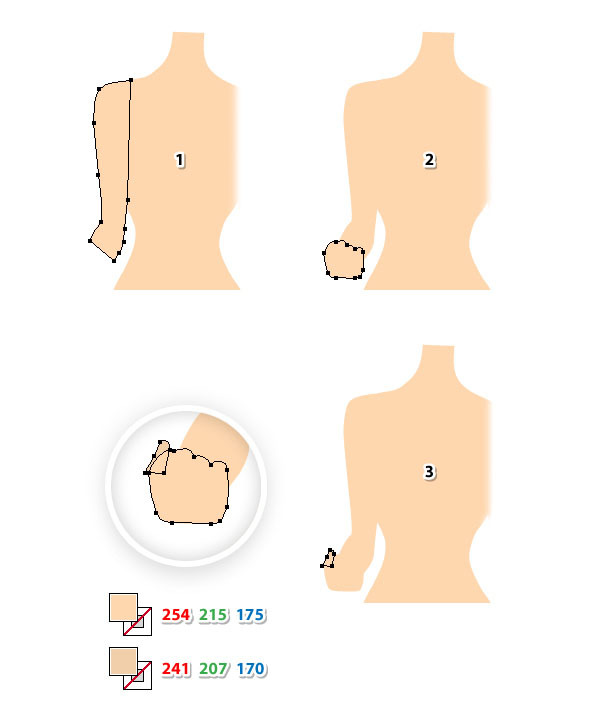 To create the fold on the arm, draw a curved path as shown below. 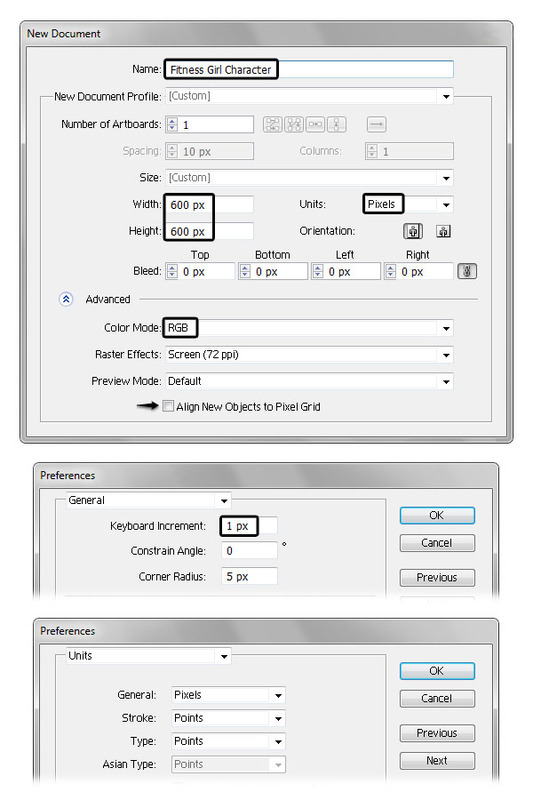 Select a 0.75 pt Stroke and the Width Profile 4 in the Stroke panel. Let’s create the sports bra. Start by drawing a curved path above the waist (1). 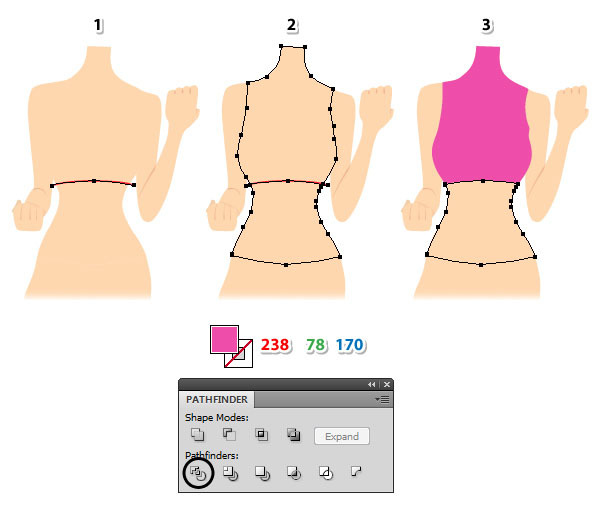 Now, select the “upper body” and then Copy and Paste in Front (Control-F) in order to create a copy of it (2). Having this copy selected along with the path, press Divide in the Pathfinder panel and then Ungroup (Shift-Control-G). As a result you will get two separate shapes. Fill the shape at the top with bright pink and delete the shape at the bottom because you don’t need it.